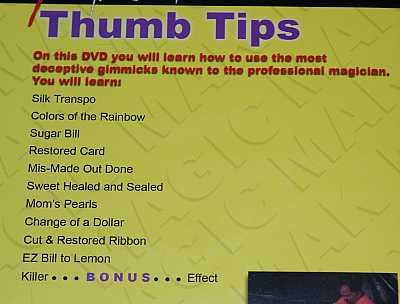 This DVD teaches 11 different effects with your thumbtip, and because these are different uses than the standard effect, even laymen who know about the gimmick will not easily connect it to these effects. Effects included can be seen on the photo of the back of the box. This DVD sells online for $9-$12, but we'll price it well below that, because we got a good deal on a few of them, and want to pass that savings on to you.